The United States Congress designated the Mount Baker Wilderness (map) in 1984 and it now has a total of 119,417 acres. All of this wilderness is located in Washington and is managed by the Forest Service. The Mount Baker Wilderness is bordered by the Stephen Mather Wilderness to the east. Mount Baker has shown steamy signs of life as recently as 1975. The volcanic mountain stands at 10,778 feet, making it the fourth highest summit in the state and the dominant feature in the southern portion of this Wilderness. Fourteen glaciers blanket the immediate region of the mountain. Add to that the frozen sheets on nearby peaks and the total perpetual ice in the area surpasses 10,000 acres. Precipitation on the heights of Mount Baker sometimes reaches 150 inches per year, with up to 18 feet of snow accumulating. Many of the ridges stand above fir- and cedar-forested drainages, dividing the sky and opening often into large heather-filled meadows that showcase riots of summer alpine wildflowers, huckleberries, and blueberries. Devil's club, salmonberry, skunk cabbage, and ferns brighten the banks of creeks and rivers. Black bears and black-tailed deer share the area, while mountain goats clamber about in the rocky high country. Just south of Mount Baker, outside the Wilderness, elk congregate in numbers rarely seen in this part of the state. The Wilderness shares its eastern border with North Cascades National Park, and lovely Mount Shuksan looms just over the boundary inside the park. Mountain climbers flood onto Mount Baker in spring and summer before fall opens numerous large crevasses. Hundreds of climbers may be seen on the mountain in a single day. The Heliotrope Ridge Trail winds 2.7 miles to the Coleman Glacier, the most popular climbing route on the mountain. A well-developed and very busy trail system provides access to the lower country. 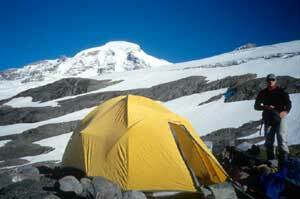 Planning to Visit the Mount Baker Wilderness? How to follow the seven standard Leave No Trace principles differs in different parts of the country (desert vs. Rocky Mountains). Click on any of the principles listed below to learn more about how they apply in the Mount Baker Wilderness.